Cooking Light (Heather) -- the June issue begins with six superfast ways to cook beef and then launches into a sorbet taste-test. Features this month include: healthy grilling, making the perfect cake, and eating in Sante Fe. A large section devoted to variations on potato salad caught my eye. The summer cookbook section is full of interesting recipes using summer fruits and vegetables. As always there are also interesting articles and plenty of other recipes. All in all, this issue has its season right (summer)! 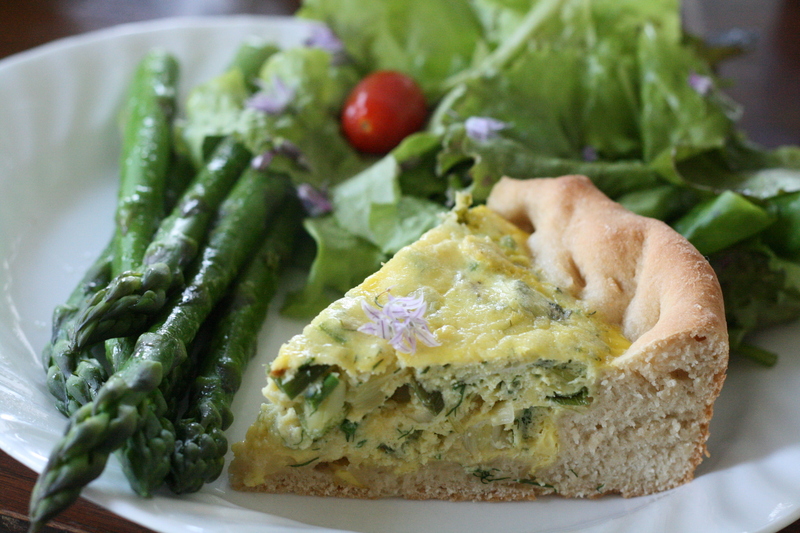 I chose to try the Herbed Ricotta Tart since I had many of the ingredients from my CSA. This recipe was simple to follow and turned out fantastic! I can't wait to make it again, and even improvise a bit on the ingredients. It is an excellent idea for a brunch -- something other than the usual quiche! Unroll dough, and press into bottom and up sides of a 9-inch round removeable-bottom tart pan coated with cooking spray. Heat a medium nonstick skillet over medium heat. Coat pan with cooking spray. Add thinly sliced green onions to pan; cook 5 minutes, stirring occasionally. Combine cooked green onions, ricotta cheese, sliced fresh chives, minced fresh dill, salt, pepper, eggs and egg white. Pour onion mixture into prepared crust; sprinkle mixture with Parmigianno-Reggiano. Bake at 375F for 35 minutes or until center is set. Let stand 5 minutes. Cut into wedges. 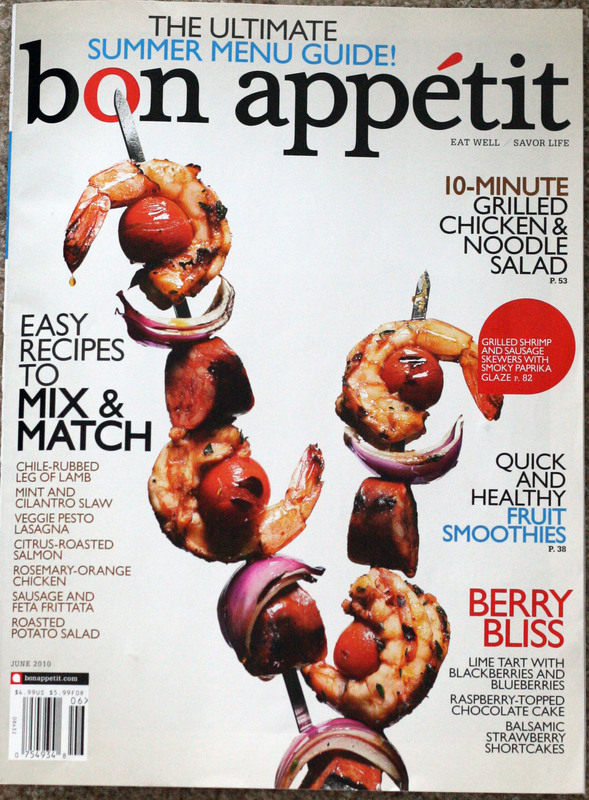 Bon Appetit (Heather) -- this issue is, of course, focused on summer. Instead of sorbets, Bon Appetit is reviewing ice-cream and giving recipes for smoothies. If you want to learn about tamarind and how to cook with it, this is the issue for you! As with Cooking Light, there are many grilled recipes and some lovely side dishes. I do feel as if the recipes in this magazine tend to be a bit more gourmet and involved -- definitely what I call weekend cooking. 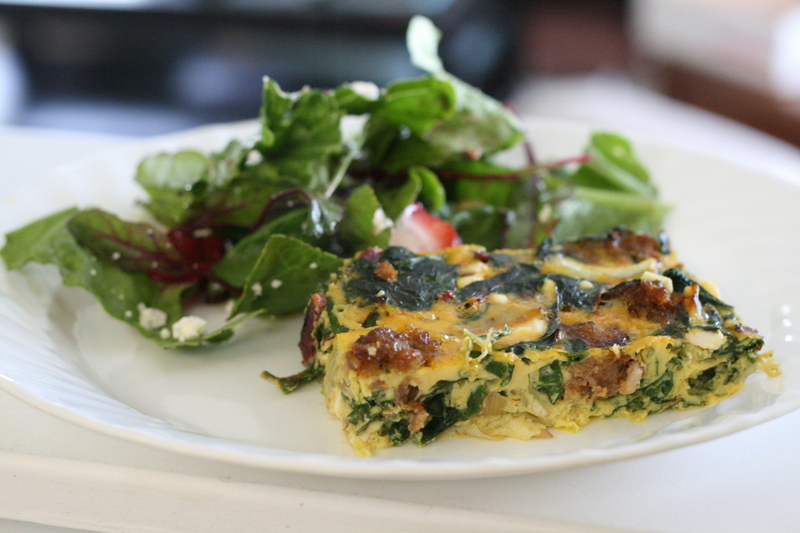 That said, the recipe I tried (Frittata Bites with Chard, Sausage and Feta) exceeded my expectations. The texture and taste were delicious, and even one of my kids who "hates greens" decided they liked swiss chard after eating this. I plan to use it as a breakfast casserole when entertaining and hope to make it again for dinner some evening. The frittata bites in the magazine were much taller, but that's because they used a smaller baking pan and I used a larger one -- mostly because I accidentally doubled the sausage, but also to help shorten the cooking time. Preheat oven to 325F. Spray an 8x8x2-inch glass baking dish with nonstick spray. Bring large pot of salted water to boil. Add Swiss chard and cook until just wilted, about 2 minutes. Drain. Finely chop chard, then place in kitchen towel and squeeze dry. Set chard aside. Heat oil in large nonstick skillet over medium-high heat. Add onion to skillet and saute until soft, 4 to 5 minutes. Add sausage and saute until brown and cooked through, breaking up with a fork, 5 to 7 minutes. Remove from heat and cool. Whisk eggs, cream, salt and pepper in large bowl to blend. Add chard and cooled sausage mixture, then feta; stir to blend. Transfer mixture to prepared baking dish. Bake frittata until set in center, 45 to 55 minutes. Transfer baking dish to rack and cool frittata 15 to 20 minutes. Place platter atop dish with frittata. Using oven mitts, hold baking dish and platter firmly together and invert frittata onto platter; place another platter atop fritata and invert again so that frittata is right side up. Cut frittata into 20 pieces. Can be made one day ahead. Place frittata pieces on rimmed baking sheet. Cover and chill. Rewarm in 325F oven until heated through, about 10 minutes. Transfer frittata pieces to platter. Garnish each piece with parsley; serve warm or at room temperature. Organic Gardening (Heather) -- Organic Gardening is not a cooking magazine, but I wanted to mention it here because it encourages so much of what we like here at The Cooks Next Door: local, fresh, seasonal, organic. This magazine has been around since World War II, and year after year brings helpful articles on how to grow your own food. 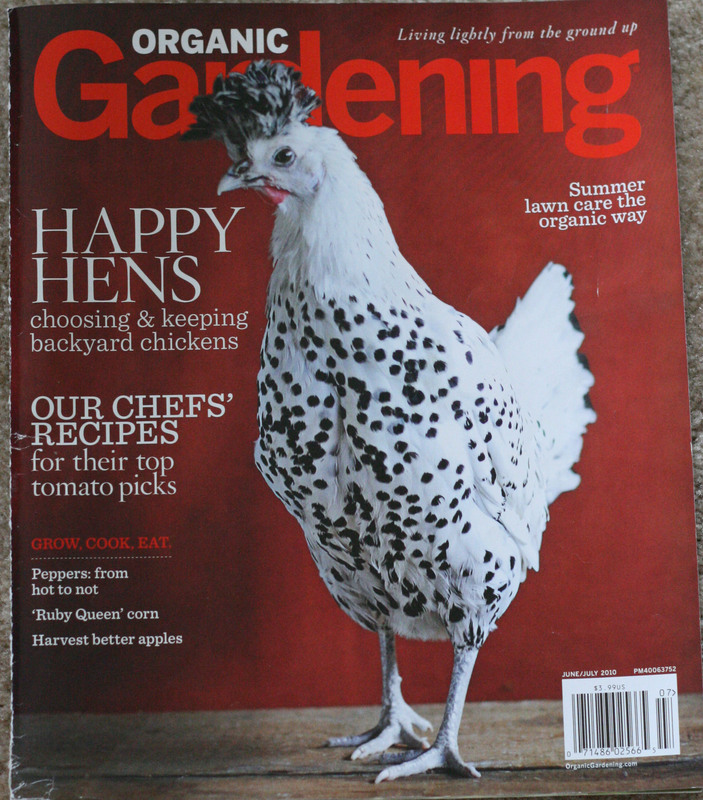 The June/July issue includes articles on cooking with tomatoes, keeping hens in the backyard, varieties of peppers, a rural garden in England, and caring for your grass in a greener way. Scattered throughout the magazine are many more short, helpful articles for your garden or yard. Having seen watermelon and tomato salads mentioned everywhere this summer, I decided to try the recipe in Organic Gardening. The result was beautiful, as well as delicious. 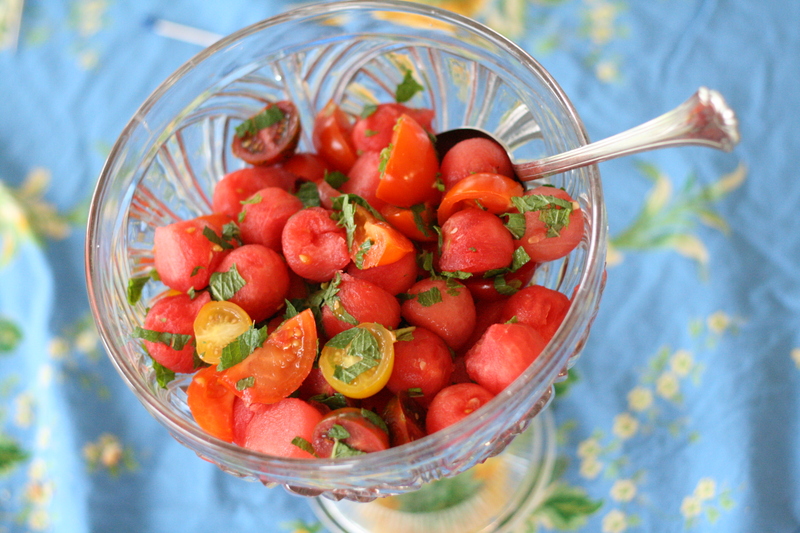 Seasoned with salt, lime juice and basil shreds, the combination of watermelon and tomatoes worked well together. It's the perfect salad to bring to your next summer gathering. Toss all ingredients together in a mixing bowl. Serve immediately or refrigerate for up to 24 hours. 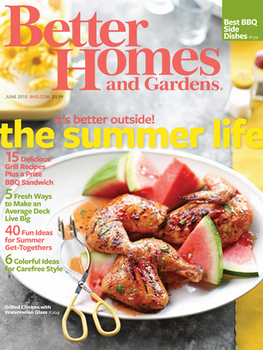 (Alaina) I haven't written about Better Homes & Gardens but I really like this magazine. It's especially great for summer with the combination of gardening, home decorating, and recipes. They offer interesting articles and many do-it yourself project ideas. The recipes include several grilling recipes. The Corn & Blueberry Salad, the Chocolate Marchmallow Ice Cream Sandwiches, and the twists on BBQ sauce are all recipes I would like to try! I decided to make the Junebug "Mocktail" (a non-alcoholic mixed drink). It was quite sweet but my family really liked it! You could serve this as a dessert with a scoop of sherbet on top. It's quite refreshing for a hot day! 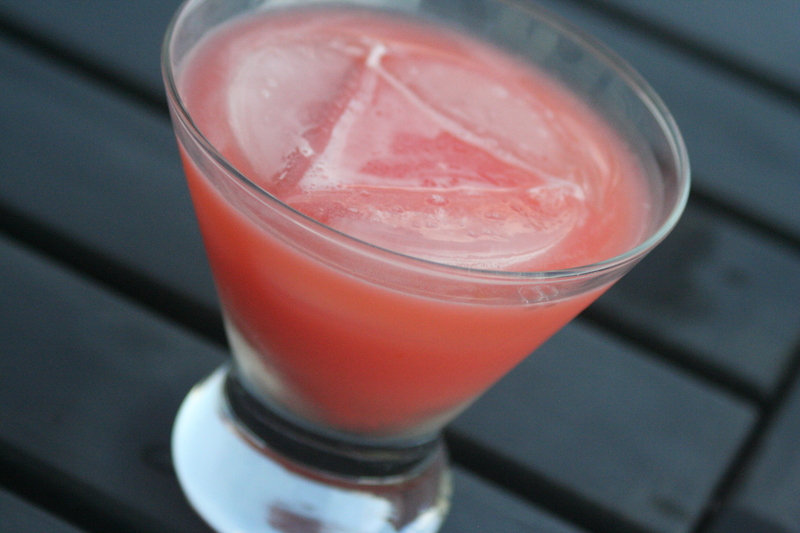 Blend together ginger ale, grenadine, orange juice, and sherbet. Pour into ice-filled cocktail glasses. 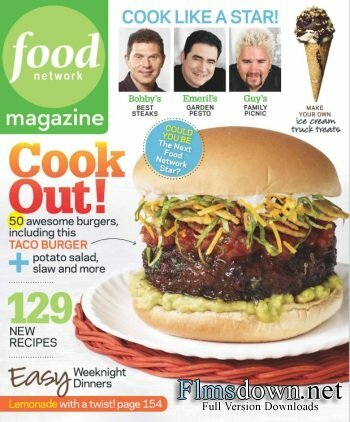 (Alaina) Food Network Magazine has a great issue including many summer recipes and many grilling recipes. This magazine draws from a variety of different chefs which makes for a really good publication. They continue to provide a 50 recipe pull-out section - this month features burger recipes which is perfect for summer. The different sauces and pestos looked delicious as well as the Foil-Packet Fish w/Corn Relish, Watermelon-Cucumber Salad, Strawberries and Cream Tart, and Blackberry Lemonade! 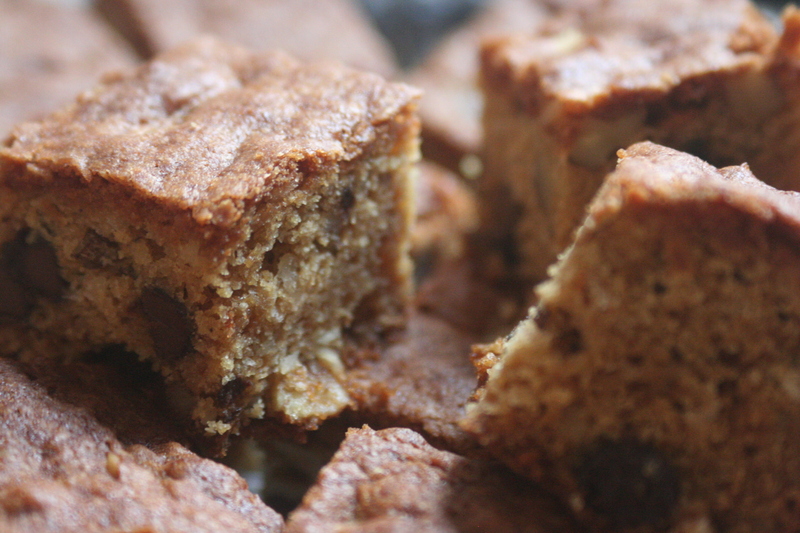 I was in need of a quick dessert, so I made Guy Fieri's Blondies w/Dark Roots. These were better the next day and definitely better served completely cooled. While I liked these, I probably won't make them again because they were a little cakier and a little drier then I prefer. The combination of the coconut, pecans, and dark chocolate was really nice, though! Preheat the oven to 350 degrees F. Spray an 8-inch-square glass baking dish with cooking spray. Whisk the flour, baking powder, baking soda and salt in a small bowl. Beat the butter and cream cheese in a large bowl with a mixer at medium speed until fluffy. Add the brown sugar and beat 3 to 4 more minutes. Beat in the egg and vanilla. Add the flour mixture and mix on low speed until just combined. Fold in the hazelnuts, coconut and chocolate chips with a wooden spoon. Spread the batter in the prepared pan and bake until a toothpick inserted into the center comes out clean, 35 to 40 minutes. Let cool 20 minutes in the pan before slicing.